Posted by Stuart Herbert on June 9th, 2010 in Cardiff, Coal, Glamorganshire Canal, Great Western Railway, Historical, Iron & Steel, Modern, Photos, Shoot. From 1794 through to at least 1951, this was the East Canal Wharf of the Glamorganshire Canal. In the foreground runs the GWR railway (the main Swansea to London line still in major use today), built by 1850 by the South Wales Railway Company, which would have had to have bridged the canal at this point. The red brick building in the top-right is the remains of the York Hotel, which adjoins Custom House, once the administrative home of the Glamorganshire Canal when operations were moved from Navigation House in Navigation (modern-day Abercynon). Behind where I’m stood today is Callahan Square, but in the past this would have been the wharfs that stretched all the way down to the River Taff over a mile away: Sea Lock Pond, the first of Cardiff’s great docks. 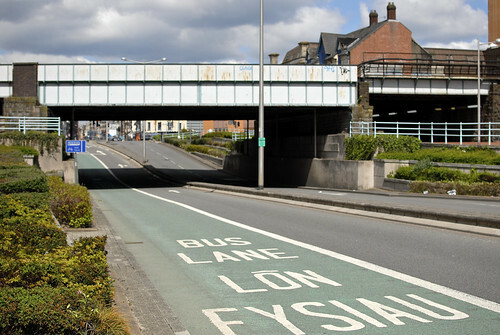 You can clearly see in this photo how the road under the GWR bridge has to drop for cars and buses to fit underneath. My guess is that the clearance was a lot less when this was still canal! Nice post. I’ve always had a keen interest in canals in general and the Glamorganshire Canal specifically. My grandfather once walked the whole canal from Merthyr to Cardiff docks! It’s a real shame that most of the canal has now gone. Also, spotted that you use the WP-Geo plugin. Hadn’t really seen this plugin for WP before. Very useful. Started using it on my own blog – http://www.south-wales.org/2010/st-augustines-church-penarth/.